WASHINGTON, Feb. 5, 2019 /PRNewswire/ -- Wounded Warrior Project® (WWP) is renewing its support of Tragedy Assistance Program for Survivors (TAPS), an organization committed to providing compassionate care and survivor support services for anyone who has suffered the loss of a military loved one. Support three intensive clinical programs through WWP's Warrior Care Network® program partnership. This will be followed by ongoing peer-to-peer support and web-based psychoeducation. Support the design and delivery of TAPS trainings on suicide prevention, intervention, and postvention for warriors and family support members participating in WWP's Warrior Care Network® and WWP staff. TAPS (https://www.taps.org/) also connects servicemembers, veterans, and families who are survivors of suicide loss to resources and peer support. TAPS programming empowers survivors to navigate their grief, and also provides training to warriors and family members for suicide prevention, intervention, and postvention. "Suicide prevention remains a top priority for Wounded Warrior Project, and we're proud to work with TAPS on this critically important endeavor," said René Bardorf, WWP senior vice president of government and community relations. "TAPS provides care and resources for families who lose a loved one to suicide, and helps them cope." "TAPS is grateful for the partnership with Wounded Warrior Project. Over the past several years we've seen a growing need as more families come to us after the loss of a military loved one to suicide," said Bonnie Carroll, TAPS President and Founder. "This partnership enables TAPS to expand our efforts to provide world-class trauma care and support to our most at-risk population, survivors of military suicide. Additionally, TAPS will be able to use lessons learned on the look back to teach suicide prevention for vets and postvention for loved ones." Since 2012, WWP has partnered with over 120 organizations involved in the care of America's military community by providing more than $74 million in grants. To learn more about how WWP partnerships with organizations like TAPS are improving the lives of millions of warriors and their families, visit https://wwp.news/Newsroom. 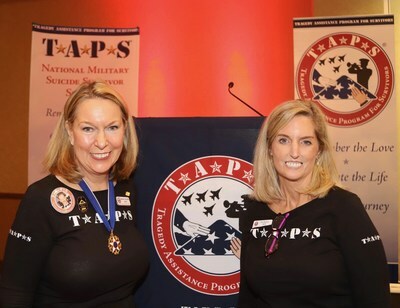 The Tragedy Assistance Program for Survivors (TAPS) is the leading national organization providing compassionate care and survivor support services for the families of America's fallen military heroes. Since 1994, TAPS has offered support to more than 85,000 survivors of fallen military in the form of peer-based emotional support, grief and trauma resources, grief seminars and retreats for adults, Good Grief Camps for children, case work assistance, connections to community-based care, online and in-person support groups and a 24/7 resource and information helpline for all who have been affected by a death in the Armed Forces. Services are provided free of charge. For more information go to www.taps.org or call the toll-free TAPS resource and information helpline at 1.800. 959.TAPS (8277).